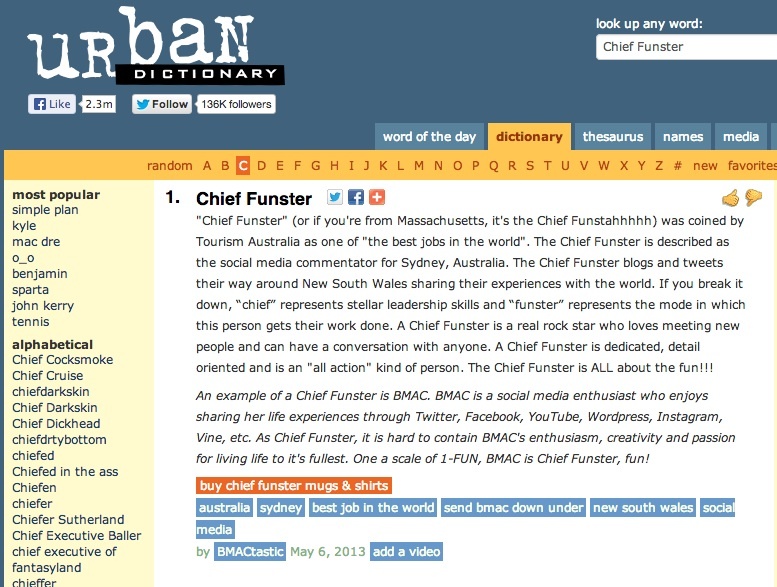 First I wake up to find out that I made it to Top 3 for Chief Funster and now AUSTRALIA, my dream, is CALLING ME at 5am to CONGRATULATE ME on getting the opportunity to go visit THEM?! How many awesome things can happen in one day?! Try how many awesome things can happen in 2 weeks!!! 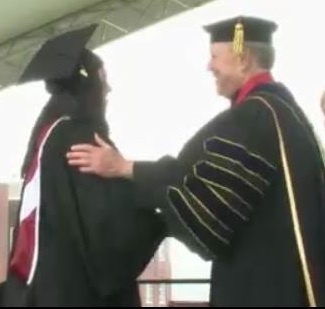 Ever since this moment, my life has been a whirlwind and I’m loving every moment. Each day I lose a little more sleep, but I gain a little more excitement! I DID IT! 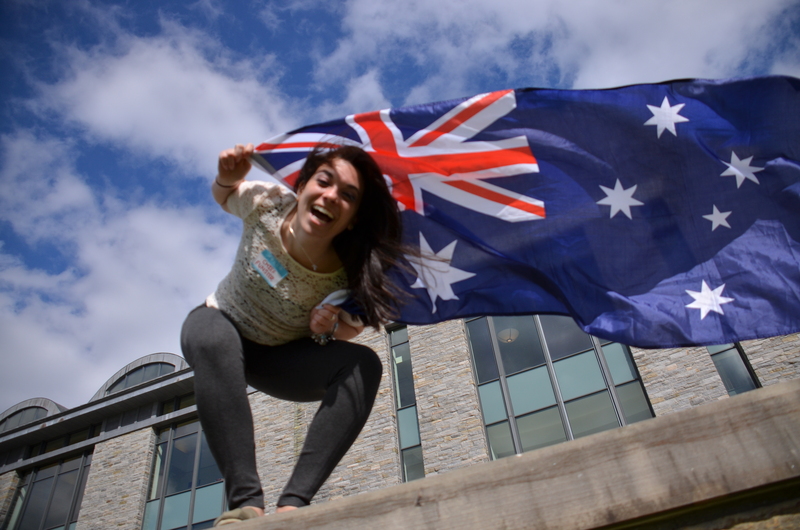 I’M GOING TO AUSTRALIA! WAHOO!!!!!!! I got countless texts, calls, tweets, likes, posts, etc of congratulations and they are still coming in! I am very proud of myself and am thrilled that Australia has selected me to go down undahhh to interview with them in person. For all of you who were worried about me during finals week… I made Dean’s List, so I must’ve done alright! 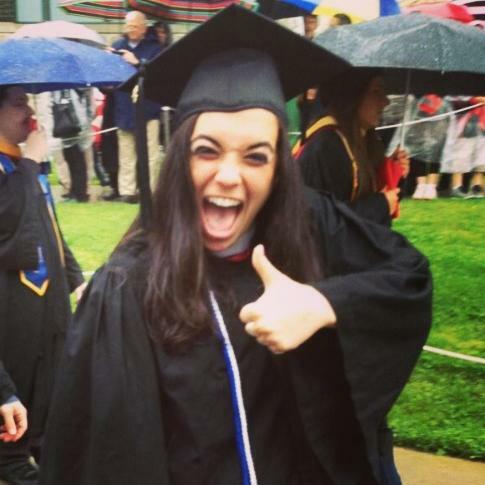 OH, and I graduated from Marist College this past Saturday with a Bachelor of Arts degree in Communications- Advertising and a minor in Business. Not too shabby, huh? YEP! That’s my ENTIRE graduating class right there SCREAMING “Send BMAC Down Under” and doing the Aussie cheer! I graduated with over 1,400 people and ALL OF THEM are represented here [although we couldn’t get a wide enough angle to show everyone] and how fabulous does that “SEND BMAC DOWN UNDER” sign look?! Thank you, President Murray for ordering the sign and getting the Marist College graduating Class of 2013 to celebrate with me! I was also featured in follow up articles with The Boston Globe, Newsday and The Poughkeepsie Journal. Tomorrow morning I am going to be on Fox 25 News where I will be interviewed by Gene Lavanchy about The Best Jobs In The World contest, Chief Funster and Send BMAC Down Under! How cool is that?! I am BEYOND excited for my television debut! But what shall I wear? Find out tomorrow morning at 8:55am on Fox 25 news! The announcement for the Top 3 Chief Funster finalists is just a day away!!! Tomorrow evening I will know what my Chief Funster fate is. 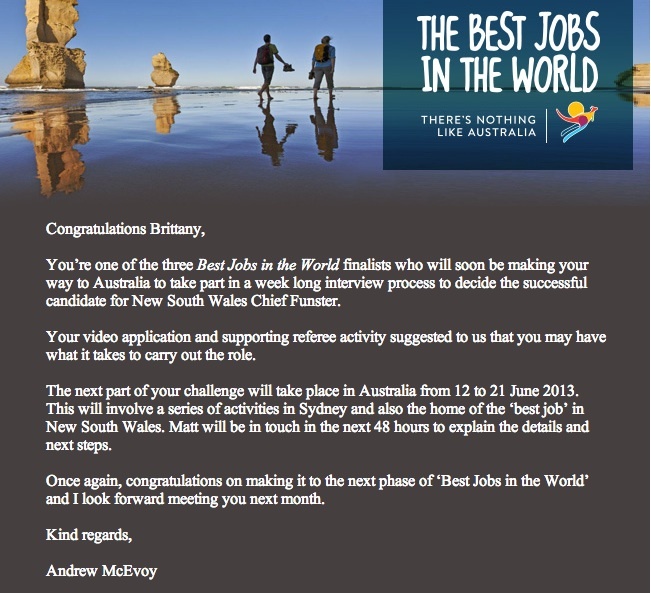 If I make Top 3, this means that I fly down to Australia for a week in June for final interviews. It’s a crazy feeling knowing the reality of my future is so close. My heart has been racing all day today with the anticipation of tomorrow’s big announcement. The doubt has started to set in where I feel like I didn’t do enough and/or should have done even more to express my excitement and passion for the position of Chief Funster. I know this is a normal feeling leading up to such a big announcement like this, I just have to keep thinking positively! I do happen to have a challenge for YOU, my wonderful Send BMAC Down Under followers, should you choose to accept it! We need to show the contest all of the people who support me and believe in me for the position of Chief Funster. I need you to engage with me on my social media pages and show your support to Send BMAC Down Under!!! This means tweeting to me, posting on my Facebook timeline and sharing my blog. I encourage your creativity for a tweet and Facebook post! 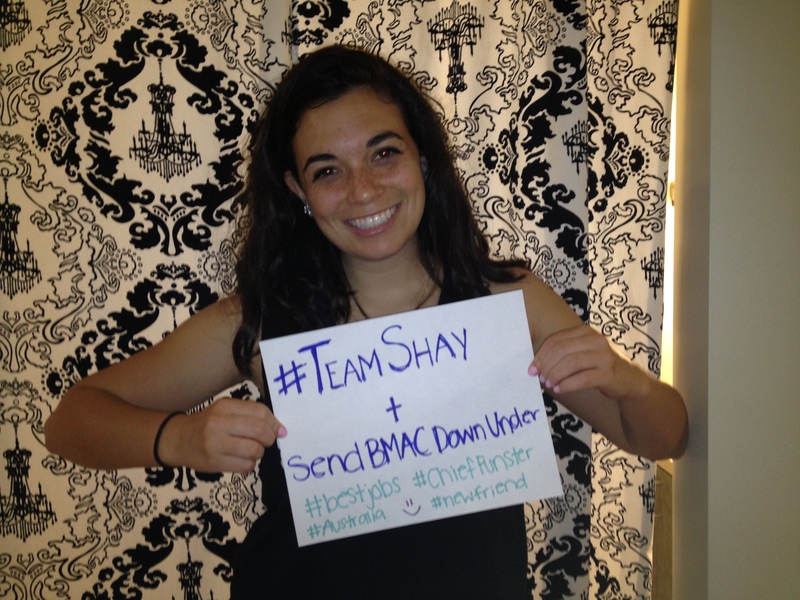 Tweet @BMAC_DownUnder using #SendBMacDownUnder and your personalized message to me! 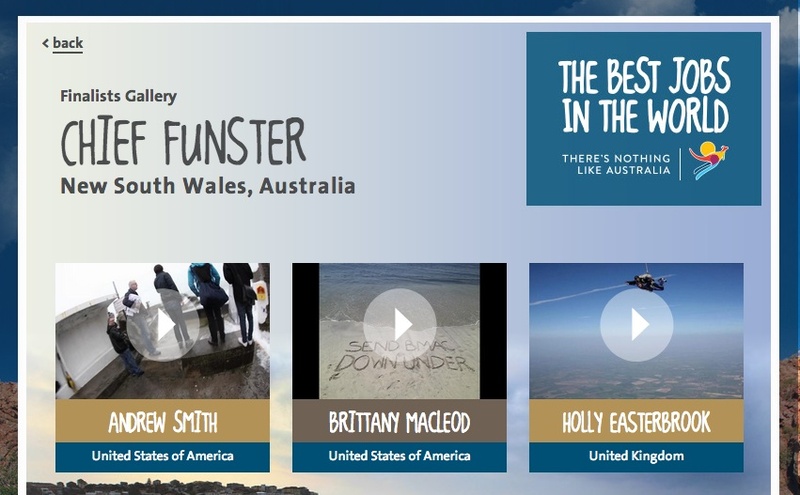 Tell @Australia and @ChiefFunsterNSW why they need to pick me! I really need your help for this one! Please rally and support to help me show Australia that I am the one they need to bring tourism to Australia and live the life of a Chief Funster!!! Andddddd CUT! That’s a wrap, folks! Round 2 of the Best Job In The World contest is officially over. Yesterday I submitted my final official report to Tourism Australia of all my efforts and everything I accomplished in round 2. I tried to make it crisp and to the point. Here is a piece of what I sent in with my report. Click below to see the video I made summarizing my efforts for this round of the contest! There was a lot that I couldn’t fit into the video or wasn’t meaningful enough to report to Australia. I wish Australia could’ve seen my phone ringing off the hook the whole 2 weeks of different people and places calling me back and making moves for this round. I transformed from a “regular student at Marist College” to the CEO of my own PR agency handling my number one client “Send BMAC Down Under”. 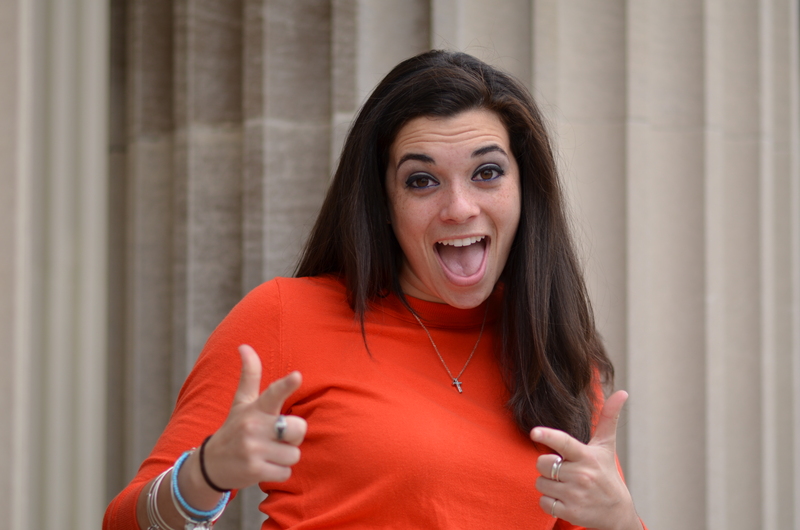 For an advertising major, I certainly learned a lot about public relations these past 2 weeks. I had dabbled with PR before, but I would say I’m efficient in it now. I had so many things running through my head before I pressed the “send” button, as I’m sure all the other Chief Funster candidates did. I had so many thoughts and yet none at all at the same time. My mind was blank. I was just staring at the screen. There was nothing else for me to include. I knew I covered everything. My heart was pounding like a drum and I could feel the energy rush through my finger tips as my pointer finger hovered over the “send” button and then *click*… it was gone. My entire report sent into cyber space and in the hands of the contest judges. It’s up to them now. My future is in their hands. When you want to be successful as much as you want to breathe, then you’ll be successful. First you have to want something. Really want something. When you think of this “thing”, you feel the burn in your body. The fire ignites in your stomach and spreads out to the ends of your body. You fall asleep thinking about this “thing” and wake up with the same thoughts on your mind. It’s similar to the way you feel when you’re in love. Next step: do whatever it takes to get this “thing”. Don’t let ANYONE stop you. It takes 8 “no”s in sales before you get 1 “yes”. Let me just tell you what that sounds like… No. No. No. No. No. No! No! NO! yes. People are always waiting for you to fail. No one wants to see someone else succeed. It’s a dog eat dog world out there. People only want what is good for his or herself. My advice to you? Be relentless. That’s a powerful word right there. Do it. Be relentless. But don’t do anything that doesn’t seem natural. Do you. Be you. No one else could possibly be you, so do you. The ultimate key to success, you ask? Do what you love. It’s what you want to do. Everything else will fall into place from there. It’s true what they say, when you do what you love, you never work a day in your life. So do what you love. I really love social media. What I love even more than social media is having fun! Half the fun of social media is showing and talking about how much fun you had living life to its fullest. 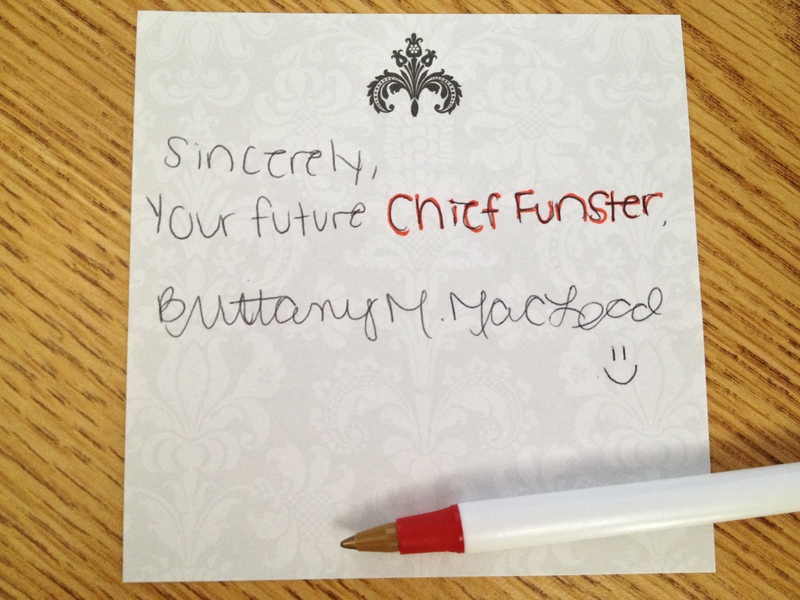 Having the opportunity to be Chief Funster would be an absolute dream come true. It makes too much sense in my life right now. I am graduating college in just over 2 weeks. I would have most of the summer off then start being the Chief Funster in August (which is my birthday month! HOLLA!). 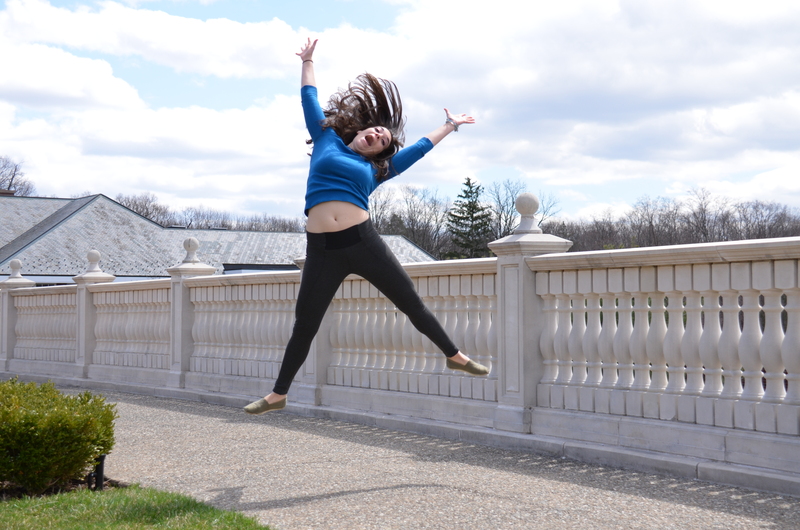 Yes, that’s right, I graduate in 17 days. I wouldn’t be sacrificing my last moments and memories EVER in college if I didn’t think every second and ounce of the time and energy I’ve put into this job wasn’t worth it. Everything happens for a reason, right?